Time to start a new thread methinks. Newcomer James Hart takes part in the first day of preseason training. The squad gathered in UL today with the newest recruits, senior players, academy players and club representatives in attendance. 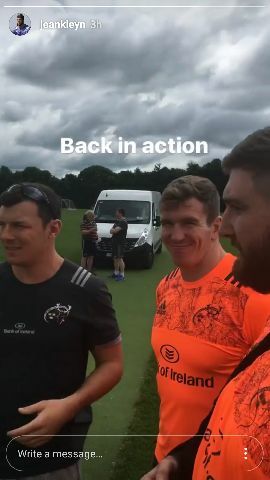 As always at this time of year a reduced squad reported for preseason week 1 with the eight Ireland representatives of Andrew Conway, Keith Earls, Jack O’Donoghue, John Ryan, Niall Scannell, Rory Scannell and Simon Zebo now on their month off following the successful summer tour of the USA and Japan. Similarly, Munster’s Ireland U20s representatives will not return to the academy and preseason programme for a number of weeks. The five recently promoted academy players – Stephen Fitzgerald, Dan Goggin, Bill Johnston, Conor Oliver and Brian Scott – joined the incoming trio of Chris Farrell, JJ Hanrahan and James Hart at the High Performance Centre in UL today. Young out-half Johnston has successfully rehabbed a fibula injury sustained at the end of March to take his place in the training lineup. In boosting the numbers, club players Ronan Coffey (Shannon), James Kendrick (UCC), Max McFarland (Clontarf), James Rochford (Dolphin) and Tom Ryan (Young Munster) also reported for preseason training today. On the rehab front Dave O’Callaghan underwent an operation on his ACL over the June break following the knee injury he sustained against Treviso at the end of April, while Darren O’Shea underwent a shoulder procedure and both players will be unavailable for the opening period of the season. Last edited by Crazyemerald; 28th-June-2017, 17:37. Any word on any other possible arrivals? We still look bare at lock. Kleyn needs to be managed carefully for first few months after injury. Home to Ulster afaik, as planned. Thats it for a while now. Whod come to a team that doesnt know its coaching ticket. We don't have enough second rows. Don't worry every top player wants to sign for a team without any coach. We'll be fine..
We have a coach and a DOR. Well, we do. There will also be a successor. It's not ideal but we do still have them.